This accessible book takes a fresh and original approach to the concept of youth, placing changes in the social construction of "youth" within a more general story of the rise and fall of grand theory in social science. Gill Jones evaluates the current relevance of these wider social theories to understanding youth in late modernity in the light of key examples of empirical work on young people. Individual chapters are organized around the themes of action, identity, transition, inequality and dependence – conceptual themes which cross-cut young people's lives. The book considers the validity of youth as a social concept and examines ways of identifying what is specific to young people without resorting to seeing them as a homogeneous group defined by their age; in so doing, it uncovers notions which are erroneously attributed to young people. Youth represents a thought-provoking challenge to a new generation of social science students, youth researchers and practitioners to distance themselves from the politically- and emotively-charged issue of youth in contemporary society and move further towards re-theorizing the concept of youth in ways which are relevant to young people’s lives today. Gill Jones is Emeritus Professor of Sociology at Keele University. "Youth usefully embeds the category of youth within wider debates in the social sciences, indicating how they have either addressed the question of youth, or could be extrapolated to have something to add to theoretical approaches to youth." "The particular value of Jones' approach is that it moves easily between social, cultural and psychoanalytical theorists to reveal what nuggets of value they hold in relation to young people." "It's all here, including the kitchen sink. Everything you ever wanted to know about youth and a few other things you hadn't thought of can be found between the pages of this book." "A very handy little book for anyone who wants a simple but comprehensive introduction to the social scientific study of youth." "An excellent textbook that will be used at many levels of study (and, I imagine, teaching!)." "Jones has written a much-needed book that will help take the burgeoning field of youth studies to a more mature and intellectually stimulating level. Her book will become THE text to use in advanced courses as students and teachers co-construct the various issues and debates that have emerged as academics have attempted to come to grips with the thorny issues inherent in understanding the changing nature of youth in changing societies." "After over twenty years of empirical research and thoughtful analysis on the subject of this book Professor Jones has distilled her considerable experience into an authoritative text that will help countless students to write their essays and, I suspect, many of their teachers to prepare their lectures. 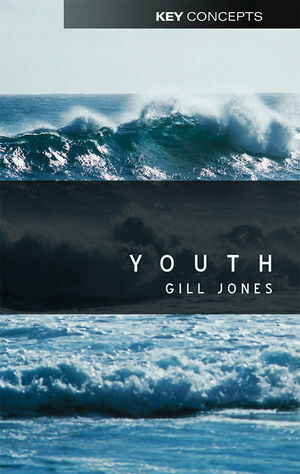 Gill Jones has established herself as the doyenne of the sociology of youth." An original presentation of the concept of youth - an exciting rethinking of the social construction of ‘youth’ that explores new ways of theorizing youth without prejudice or lumping ‘young people’ together as one uniform category. Places the concept within a wide range of contexts, considering: youth cultures, youth movements, inequalities, transitions from childhood to adulthood, issues of dependence and independence, amongst other issues. Relates the historical and contemporary understanding of ‘youth’ to wider social theory in a very accessible and practical way, offering suggestions as to how to understand ‘youth’ in the 21st century. Gill Jones is a very well respected figure in youth studies/sociology of youth - one of the most senior in the UK. This book is a succinct account of her opinion on youth today after years of research and experience in the field.